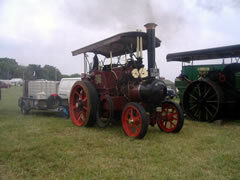 The weekend of 24th and 25th saw us attend the Kingsley Steam Rally. The weather was looking good and we were all looking forward to this event. Friday afternoon we pulled on to the site and were allocated an area where we could set up camp, it was a nice big area with plenty of room for all our gear. The evening was spent watching all the other exhibits come in. As always there was a good selections, the C.S.V.A.C. 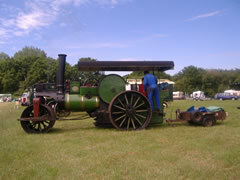 (Central Southern Vintage Agricultural Club) organise the event so there is a good amount of stationary engines and tractors. Steam engine entries seemed to be down on last year, this years engines were, Fowler 13140 “The Volunteer”, Tasker 1741 “John Wallace”, Hogs Back Brewery Sentinel 8933 and their Showman’s wagon, Aveling & Porter roller 4932 and of course Marshall 14242 “Victoria, Empress of India” and Living wagon. The motorbike line up seemed very good along with the model tent. This year they had the car park in a different field which made the rally field a bit bigger but it didn’t seem to make a difference to the field layout. This is always a good rally from our point of view, nice little trip up the road, nice site with plenty of space and therefore, loads of room to chuff round as much as we like and a good atmosphere. As always the coal was rather smokey, but that seems to be the case at most rallies these days. By mid afternoon on Sunday the public had drifted off, apparently there was a football match on! England were playing in the World Cup so our return journey to Liss was wonderful, no traffic just us and the wind in our faces. See you there next year. 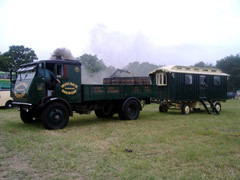 This entry was posted on Tuesday, August 22nd, 2006 at 3:13 pm	and is filed under Steam Rally News. You can follow any responses to this entry through the RSS 2.0 feed. Both comments and pings are currently closed.